This week we have an exciting challenge for you - CASE the designer! I think this is my favourite challenge so far in the history of Global Design Project, all four weeks of it, lol! 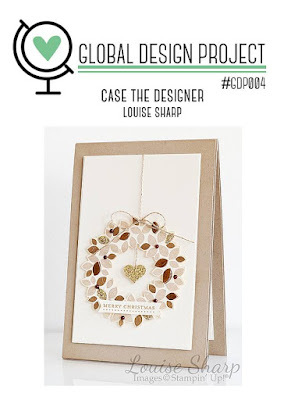 I love it because I get to use one of Louise Sharp's gorgeous designs as inspiration. Lou's card is so beautiful I really didn't want to mess too much with the original design. I used the same layout, but changed the colour scheme. While I kept the same theme, Christmas, I swapped the wreath for a Christmas bauble instead. Of course, I just had to use the Sleigh Ride framelits and glimmer paper to make the bauble! I layered everything on Dimensionals to give it a real 3D feel as well. Can you see that some of the windows in the village behind have lights on and some don't! Fiddly, but fun! The rest of the amazing DT I work with have put their own spin on Lou's beautiful card. 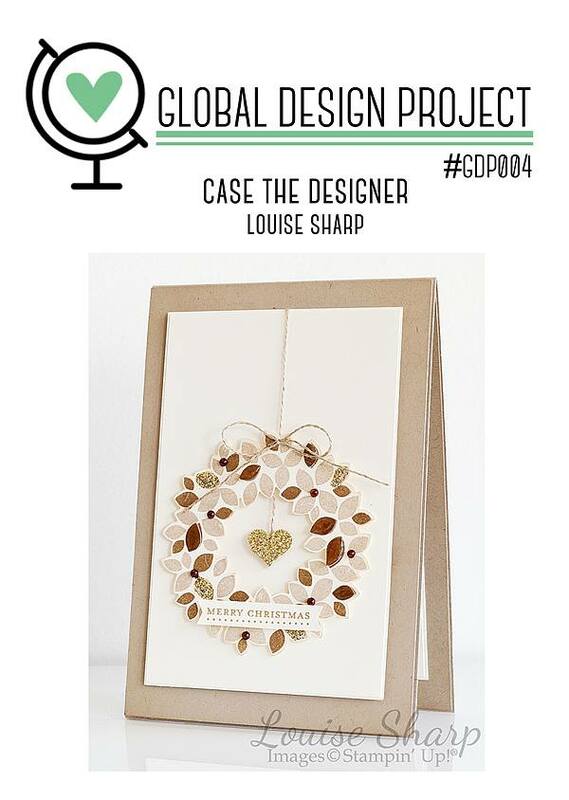 Head over to Global Design Project now to see the beautiful projects and add yours to the line up too! your card is just beautiful !! There's still time to get them Angela!! Paula, this card is an amazing use of our challenge this week. I love how you made it completely your own but yet stayed true to the original inspiration piece. You are such a sweet, talented person and I am thrilled to know you and have the opportunity to be on this design team with so many wonderful demonstrators from around the world. Hugs! This is a wonderful idea. I love your scene composition. It is just amazing what you have done in such a little space. Love it! It was a challenge to get it all on there and not make a jumbled mess Bibi, but fun! Wow alright! Your card is just outstanding Paula! What a clever clogs you are my friend! LOVE, LOVE, LOVE your card Paula. It's so beautiful. Am I the only one who never thought to use glimmer paper with the edgelits? Love all the little details you've thought of to make this one a masterpiece! Paula this is a simply beautiful card! Paula, your card is awwwwesome! This is definatly my favorite. Love it. You are so sweet Tanja! Aww, thanks Kim! They do look quite different when used in a small space, eh? They are my favourites dies - at the moment anyway! Love this look! 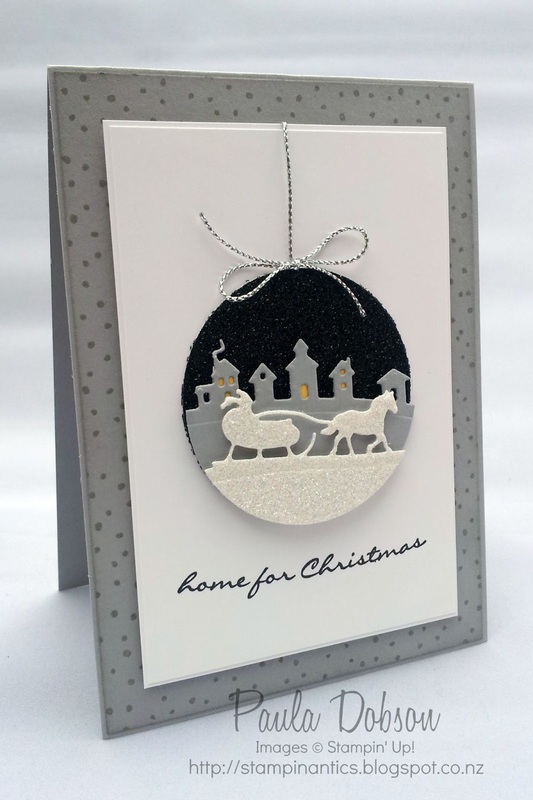 What a fun approach to Louise's card! And those yellow lights :) so fun! Thanks Holly, those lights are just too much, eh?!! Hi Kelli, I actually used the Circle Collection framelits. You just need to decide what size you would like on your card. Hope this helps. your card is beautiful; it's the little things that make a card, aren't they? TFS! Your card has just been CASEd! I handed off my card to my husband’s co-worker who was home for Thanksgiving. He will be travelling back to Suzhou, China tomorrow and will give it to my husband. His job has been really stressful lately and we haven’t been able to communicate much the last few weeks due to poor internet/phone connection. This card will be able to sit on his desk as a beautiful reminder that in just a few short weeks he will be traveling home to Indiana for the Christmas! Thanks for sharing your card with us! May I ask what color scheme you used on the wreath? It's beautiful! Hi Tamara, you will see that I actually CASEd the wreath card, it is not my own. It was designed by the very talented Louise Sharp. Guessing at the colours she used: Crumb Cake and Soft Suede, with accents of Gold Glimmer paper and perhaps Crystal Effects. Hope that helps.